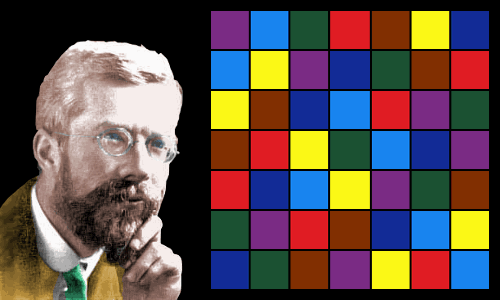 Although Ronald Fisher’s name is less well-known than some others, he was one of the twentieth century’s greatest scientists. In addition to being probably the greatest statistician ever, he also invented experimental design and was one of the principal founders of population genetics. He unified the disconnected concepts of natural selection and Mendel’s rules of inheritance. The importance of his book Statistical Methods for Research Workers in quantitative biology has been likened to that of Isaac Newton’s Principia in physics. According to geneticist and author Richard Dawkins, Fisher was the greatest biologist since Charles Darwin. Ronald Aylmer Fisher was born into a wealthy family in London, England, UK on February 17, 1890. He was the second born of twins; his elder twin was still-born. His father, George Fisher, was an enormously successful fine arts dealer who ran an auction company ranking in importance with Sotheby’s or Christie’s. His mother, Katie Heath, was a lawyer’s daughter. Ronald’s parents could afford the best private schooling for him, but his life of abundance was temporary. His mother died of peritonitis when he was 14, and his father’s business folded when he was 15. The family moved from a luxurious mansion in one of the richest parts of London – Hampstead – to a small house in one of the poorer parts – Streatham. Ronald continued to be educated at Harrow School; not because his father could afford the very high fees, but because Ronald was a brilliant student and was awarded scholarships. One of his masters later commented that, of all the students he had taught, Ronald was uniquely brilliant. In addition to his family’s ill-fortunes, Ronald was hampered by a personal disability – his appalling shortsightedness. His eyesight was so bad that he was not allowed to read under electric light because it strained his eyes too much. This particular cloud, however, seems to have had a silver lining, shifting his perspective on mathematics. He learned to visualize problems in his mind’s eye and solve them in his head rather than on paper. Even at school, Fisher viewed himself as a scientist who was especially interested in biology. He did not, however, enjoy learning the names and details of biological structures. He decided to study mathematics, believing it was through mathematics he could make the greatest contributions to biology. In 1909, at age 19, he won a scholarship to the University of Cambridge. Three years later he graduated with first class honors in mathematics. Although clearly a brilliant mathematician, his tutors were dubious about his future. They were worried that in mathematics he tended to ‘see’ the correct answer and write it down, rather than go through the usual processes of calculation and proof. After graduating, Fisher spent a further year at Cambridge studying postgraduate level physics, including the theory of errors, a topic which heightened his interest in statistics. Fisher maintained a very strong interest in evolution and genetics throughout his undergraduate days. He was particularly interested in eugenics: the improvement of the human race by selective breeding. Eugenics was then a respectable and popular scientific topic. Fisher wanted to increase the proportion of ‘socially strong’ people. He favored positive eugenics (encouraging ‘socially strong’ humans to have more children) rather than negative eugenics (preventing ‘socially weak’ humans from having children). In 1911, still an undergraduate, Fisher formed Cambridge University’s Eugenics Society, which attracted a number of prominent members. Charles Darwin’s son Leonard lectured to the society in 1912. He and Fisher became firm, lifelong friends. It was Fisher’s interest in eugenics that first prompted him to look at the genetics of a population, leading him to found – along with J. B. S. Haldane and Sewall Wright – the new science of population genetics. 1912 – published his first paper, in which he created the method of maximum likelihood. He continued refining this method for 10 years. 1912 – established the principle that there is a sample mean different from the population mean. 1913 – worked as a statistician for an insurance company and trained in Britain’s Territorial Army. 1914 – volunteered for the British Army at the start of World War 1 and was rejected because of his poor eyesight. This may have saved him from a similar fate to Henry Moseley, who volunteered successfully. 1914 – became a high school mathematics and physics teacher. He soon found he did not enjoy teaching, but had to stick with it in the absence of any other way of earning a living. 1918 – with financial help from Leonard Darwin he published a landmark paper founding quantitative genetics: The correlation between relatives on the supposition of Mendelian inheritance. Fisher also introduced the concept of variance for the first time. The paper had been delayed since 1916 because referees had difficulty understanding it. Geneticist James Crow likened this paper, written when Fisher was a high school teacher, to Albert Einstein’s great papers published when he was working in a patent office. Fisher’s new ideas and his mathematical approach to biological questions were often met with incomprehension and sometimes downright resistance. Fisher had a quick temper and became involved in some rather bitter feuds. His ability to ‘see’ the answers to complex mathematics problems was both a blessing – he made outstanding progress – and a curse – most people could not follow the logic of his arguments. The books he would later write were landmarks in biology and statistics, but often had to be explained by more ‘user friendly’ scientists before they became widely understood. 1919 – became a statistician at Rothamsted Experimental Station in central England, working in agricultural research. Here he had access to a huge amount of biological data collected since 1842. He applied his mathematical genius to the data, enabling him to invent the tools of modern experimental design. 1921 – created the statistical method of analysis of variance (ANOVA) and introduced the concept of likelihood. 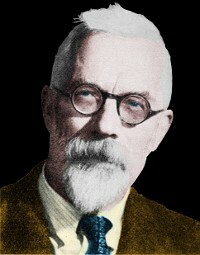 1925 – released his book Statistical Methods for Research Workers. At the time of its publication it received no positive reviews, yet it was soon to revolutionize statistics and biology. Geneticist and mathematician Alan Owen wrote that this book occupies a position in quantitative biology similar to Isaac Newton’s Principia in physics. Presidential address to the First Indian Statistical Congress, 1938: Sankhya: Vol. 4, pp 14-17. 1929 – elected to the Royal Society, joining the United Kingdom’s scientific elite. “Natural Selection is not Evolution. Yet, ever since the two words have been in common use, the theory of Natural Selection has been employed as a convenient abbreviation for the theory of Evolution by means of Natural Selection, put forward by Darwin and Wallace. This has had the unfortunate consequence that the theory of Natural Selection itself has scarcely ever, if ever, received separate consideration. 1933 – appointed Professor of Eugenics at University College London. While working in this role he studied the genetics of human blood groups, explained the Rhesus system and established the Fisher-Race notation, still used today, for Rhesus phenotypes and genotypes. Fisher’s reputation as a lecturer was reminiscent of Willard Gibbs: his lecture courses usually lost most of the students who started them. Only a small band of the smartest students could stick with his brilliant but challenging ideas. 1935 – released his book The Design of Experiments introducing the concept of a null hypothesis. 1936 – although his work was decisive in unifying natural selection with Mendel’s laws of inheritance, Fisher’s careful statistical analysis of Mendel’s data suggested all was not well. Fisher’s analysis said there was only a 1-in-2000 chance that Mendel’s results were the fully reported results of real experiments. Mendel’s results and conclusions, however, were correct. 1939 – University College London closed down the Eugenics Department and Fisher returned to the Rothamsted Experimental Station. 1943 – appointed to the Balfour Chair of Genetics at the University of Cambridge. 1952 – knighted by Queen Elizabeth, becoming Sir Ronald Aylmer Fisher. 1955 – awarded the Royal Society’s Copley Medal, one of the greatest prizes in science. Previous recipients included Benjamin Franklin, Alessandro Volta, Michael Faraday, Robert Bunsen, Charles Darwin, Willard Gibbs, Dmitri Mendeleev, Alfred Russel Wallace, J. J. Thomson, Ernest Rutherford, Albert Einstein, and James Chadwick. 1957 – retired from his chair at Cambridge, but continued working there for two years. 1959 – moved to Adelaide, Australia to do research work with E. A. Cornish at CSIRO. Now 69 years old, one of the main reasons he moved was he enjoyed the warm, sunny climate of South Australia. By the end of his career, Fisher had written 7 books and almost 400 academic papers devoted to statistics. In 1954 Richard Doll and Bradford Hill published evidence in the British Medical Journal showing a strong link between smoking and lung cancer. They published further evidence in 1956. Fisher was a paid tobacco industry consultant and a devoted pipe smoker. He did not think the statistical evidence for a link was convincing. He accepted that smoking seemed to be correlated with lung cancer, but declared that ‘correlation is not causation.’ He said a good case had been made for further research, but not for suggesting to people that they should stop smoking. Reviewing Fisher’s arguments today is interesting. He made many valid scientific points against the research linking lung cancer to smoking. History and further research, however, proved him wrong. Fisher married Ruth Guinness, a physician’s daughter, in 1917. He was 27, she was 17. Together they had seven daughters and two sons. Their eldest son George was killed in action flying his fighter plane in 1943, during World War 2. Fisher’s marriage then fell apart. Fisher was known to have a quick temper: he got involved in scientific feuds and could be rude to people he disagreed with strongly. On the other hand, his many friends reported that he was warm, likable, friendly, had a sharp and appealing sense of humor, was engagingly eccentric at times, and was an intellectually stimulating companion. He was generous with his ideas: many people who talked to him were able to publish work as their own when Fisher’s informal, uncredited contributions had been vital. Ronald Fisher died aged 72 on July 29, 1962, in Adelaide, Australia following an operation for colon cancer. With bitter irony, we now know that the likelihood of getting this disease increases in smokers. Ronald Fisher was cremated and his ashes interred in St. Peter’s Cathedral, Adelaide. "Ronald Fisher." Famous Scientists. famousscientists.org. 17 Sep. 2015. Web.